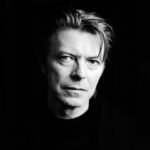 David Robert Jones known professionally as David Bowie was an English singer, songwriter and actor. He was a leading figure in popular music for over five decades, acclaimed by critics and other musicians for his innovative work. His career was marked by reinvention and visual presentation, his music and stagecraft significantly influencing popular music. During his lifetime, his record sales, estimated at 140 million albums worldwide, made him one of the world’s best-selling music artists. In the UK, he was awarded nine platinum album certifications, eleven gold and eight silver, releasing eleven number-one albums. In the US, he received five platinum and nine gold certifications. He was inducted into the Rock and Roll Hall of Fame in 1996. "I believe that I often bring out the best in somebody’s talents." "Music itself is going to become like running water or electricity. So it’s like, just take advantage of these last few years because none of this is ever going to happen again. You’d better be prepared for doing a lot of touring because that’s really the only unique situation that’s going to be left." "I’m well past the age where I’m acceptable. You get to a certain age and you are forbidden access. You’re not going to get the kind of coverage that you would like in music magazines, you’re not going to get played on radio and you’re not going to get played on television. I have to survive on word of mouth." "As you get older, the questions come down to about two or three. How long? And what do I do with the time I’ve got left?" "There’s a schizoid streak within the family anyway so I dare say that I’m affected by that. The majority of the people in my family have been in some kind of mental institution, as for my brother he doesn’t want to leave. He likes it very much." "Since the departure of good old-fashioned entertainers the re-emergence of somebody who wants to be an entertainer has unfortunately become a synonym for camp. I don’t think I’m camper than any other person who felt at home on stage, and felt more at home on stage than he did offstage." "And I saw the sax line-up that he had behind him and I thought, I’m going to learn the saxophone. When I grow up, I’m going to play in his band. So I sort of persuaded my dad to get me a kind of a plastic saxophone on the hire purchase plan."